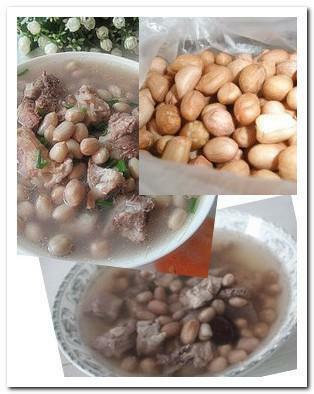 Peanut-pork rib soup is a typical Chinese home-cook soup. It is very popular in many Chinese families. This soup needs long hours cooking, it is better if cooking in a slow cooker. The outcome is very soft and aromatic peanut and really tender pork rib. Some lotus roots may add to increase the flavor and the nutrition value of the soup, and the lotus roots always remain crunchy. In a pot, add in water and pork rib, cook until boiling. Turn to low heat and simmer for 15 minutes. Add in potato and carrot, continue to simmer until everything is tender. Or after the water is boiling, transfer pork rib and water together into a slow cooker, simmer for 20 minutes, add potato and carrot. Cook until everything is tender.